CELTIC have made an offer of £1.5 million for Dundee United striker Nadir Ciftci, Belgian goalkeeper Logan Bailly is close to signing a deal at Celtic, and Rangers manager Mark Warburton has been encouraged to speed up his summer recruitment process. Celtic have matched Dundee United’s asking price for Nadir Ciftci with a £1.5 million offer for the striker. Belgian goalkeeper Logan Bailly is poised to become Celtic’s third signing of the summer transfer window. The 29-year-old is expected in Glasgow today to undergo a medical with the Scottish champions after his move from Belgian club OH Leuven was agreed in principle yesterday. Alex MacDonald has expressed encouragement at the fresh direction Rangers are seeking to take under new manager Mark Warburton this season. But the Ibrox legend also believes the new man in the hot seat at his former club must step up his player recruitment process if they are to hit the ground running in the new campaign. 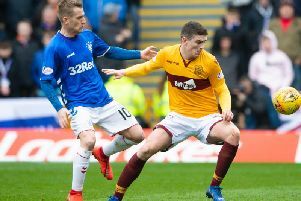 With less than three weeks of pre-season preparations remaining, Rangers have so far signed three new players in goalkeeper Wes Foderingham and central defenders Danny Wilson and Rob Kiernan. Striker Jelle Vossen has agreed a three-year deal to join English Championship side Burnley, ending the long running narrative that the Belgian was going to sign for Celtic. The player previously stated his ‘admiration’ for the Scottish champions when quizzed about the supposed interest. Hearts have decided against offering a contract to trialist Mergim Bajraktari. The Swiss-born Albanian 22-year-old, most recently of Stade Nyonnais, had spent some time training at Riccarton before joining Robbie Neilson’s squad on their pre-season trip to Ireland last week. Alan Stubbs today told new goalkeeper Antonio Reguero that Mark Oxley remains Hibs’ No.1 after the Spanish star signed a one-year deal with the Easter Road club. Premiership striker Kris Boyd has become the latest in a line of footballers including Wayne Rooney and James McFadden to have a hair transplant. Christian Nade’s determination to prove himself as a top flight player in Scotland has paid off with the 30-year-old French-born striker being offered a deal with Hamilton Accies.